This patisserie is a small, crowded, and beloved shop in Montreal’s Mile End neighbourhood. We ordered an almond croissant (the first of several that day) and their namesake pastry, Kouign-Amann (pronounced kwee-nwa-man). Kouign-Amann ( …try it again) is a type of cake originating from the Brittany region of France. The name translates from Breton as ‘butter cake,’ and that couldn't be a more apt description. Butter and sugar are folded into layers of bread dough and baked, creating a layered pastry with a thick outer casing of chewy, caramelized sugar. The ‘cake’ is sliced into wedges and sold. Just when you think you’ve got butter, sugar, and flour figured out, you discover a new way the ingredients can be combined. Amazing. This was our most exciting find of the day, and might just be the single best piece of pastry we had on the trip. Janice from Kitchen Heals Soul recommended this place when she heard of our Saturday morning plans (she's just full of good advice). Here we ordered a red bean brioche bun and an almond croissant. The brioche was soft and buttery, but the group’s overwhelming preference was for the near-perfect almond croissant. It was flaky, crunchy, buttery, and stuffed full of salty sweet almond paste. It was the best of its kind that day. Ruby Roy first introduced us to this little bakery/brunch joint on our food tour of Montreal. In addition to being one of the most charmingly quaint cafés we’ve ever been to, each and every one of their desserts looked stunning. 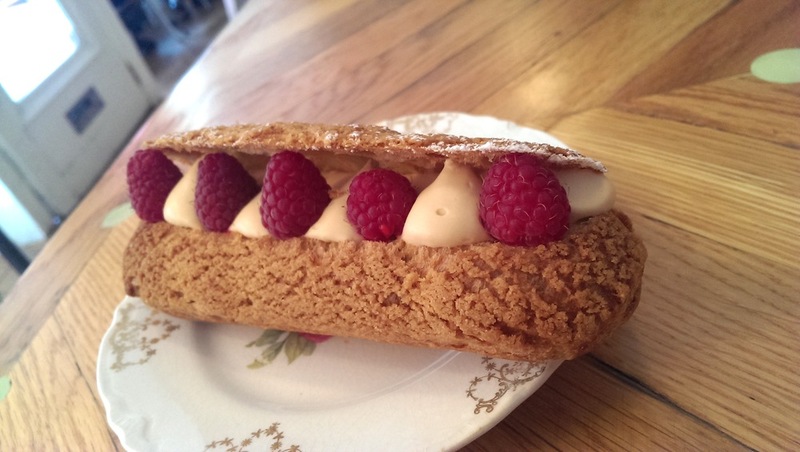 Here we selected a seasonal (raspberry) Éclair, and this wonderfully whimsical lemon tart. Rhubarbe serves brunch on weekends, and turn up the adorable every summer when they sell home-made popsicles out of their kitchen window. An old favourite of Caylee’s, we went to Mamie Clafoutis for an ‘Oh Mon Dieu’ and another almond croissant (can you tell they’re a favourite?) The Oh Mon Dieu, or ‘Oh My God’ is a chocolate croissant stacked with about an inch of chocolate ganache at its centre. If you’ve ever ordered a Pain Au Chocolat and been disappointed by the amount of chocolate unevenly dispersed, you will very much appreciate Mamie Clafoutis' respect for the combination and balance of chocolate and pastry. Montreal is a devastatingly perfect place for croissant crawling, and each patisserie brought its own unique contribution to the experience. I am now wondering why this isn’t a more regular part of my life; it’s a great way to quickly discover more of a city. We were each able to try eight different things from four different shops in just one morning, a feat which would have resulted in an ill and immobile Saturday afternoon if attempted individually. Wherever you are, pick a Saturday, plan a route, find some calorie-appreciating friends, and put your bikes and digestive systems to use. I think you’ll find it a very pleasing way to spend a Saturday.